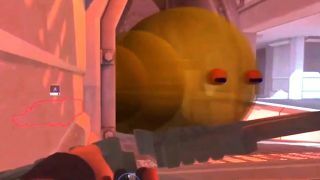 Watch this early Overwatch footage to meet The Dogeload, and… a googly-eyed caterpillar? Blizzcon 2017 introduced future Overwatch support hero Moira and the incoming Blizzard World map, then the Overwatch Archives panel went in the opposite direction. Overwatch game director Jeff Kaplan and lead writer Michael Chu took their audience on a historical journey from the game's conceptual stages (as an offshoot of the cancelled "Project Titan" MMO) all the way past its first Blizzcon appearance. Best of all, they showed a ton of in-development footage that had never before left the halls of Blizzard. This 13-minute long video covers some of the highlights. Scroll on for gifs and quotes of the most illuminating (and hilarious) examples. "Reaper's in the game now, you're gonna see the world's coolest Death Blossom animation, it's coming up right here," Kaplan says. "This is what the game looks like to us when we're making it!" "Those are actually Reaper's animations on Hanzo," Chu explains. Or, as Kaplan succinctly puts it: "Cool guy Hanzo!" "We didn't have a payload, so we had this truck," Kaplan says. "And then we didn't have art for the icon so we used the doge. Maybe if we switched back to that icon, people would actually be attracted to it in some way?" "We were working on this ability called Dragonstrike, that was going to be this moving area of effect that causes damage," Kaplan says. "And so for us to do that we rendered these spheres, Mike Heiberg rendered these spheres. And it quickly became known as the caterpillar. And you can see it - there it is! He put googly eyes on it on the other side." "Bastion, his first day in the game! Perfect," Kaplan jokes. "It turns out 'transforming robot' was hard." "Here comes the hot tub, as we used to call it," Kaplan says. "The victory pose in the hot tub. So that's actually the origin point of the map and we didn't have the victory pose point placed." "This is an early Genji prototype on Gibraltar, when he only had the Dragonblade and he could perch like you're seeing him do here and then run around and murder everybody. So when people thought it was a nerf going from 8 seconds to 6 seconds on the ult, imagine it forever. Forever Dragonblade is what Genji started out as." For more on Overwatch, check out this rad-looking, official D.va headset, and read about the genius behind Overwatch's special events.